The ANZ World Commodity Price Index fell marginally in December to finish the year down 3.4% y/y. The 0.2% fall in the index in December was the smallest of seven consecutive monthly decreases recorded since May. A strong year for forestry prices was not sufficient to offset the weaker prices recorded in the dairy, horticulture and aluminium sectors. 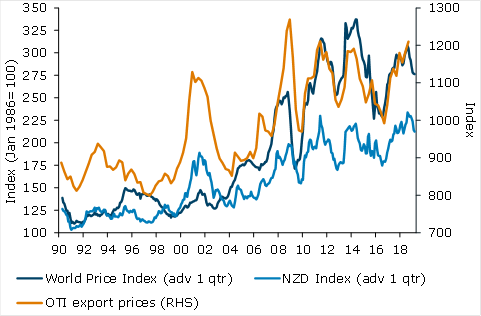 The NZD index fell by 0.9% m/m in December. The index fell 2.2% across 2018 when measured in local currency terms.